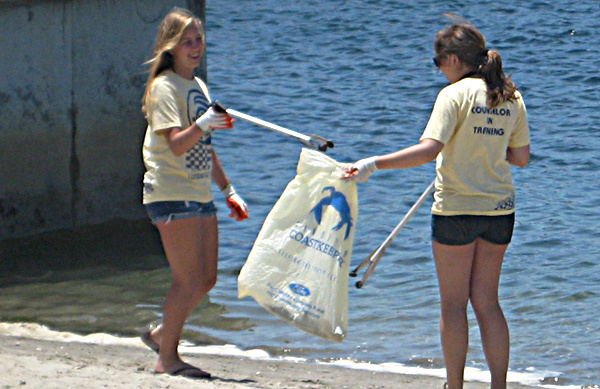 In celebration of Earth Day we will be hosting a beach cleanup on Sunday, April 19th, 9am-12pm. Bring your friends or family down to Mission Bay Aquatic Center where we will have all the supplies needed for you to help in our effort to keep our beach and bay areas clean and beautiful for all to enjoy. Since we began hosting beach cleanups we have had over 200 volunteers pick up nearly 200 pounds of trash off our local beaches. Our beach cleanups are just one way that we do business sustainably in addition to all of our other efforts that we do throughout the year. We are 100% solar powered, and actually generate more energy than we use during a calendar year. Around MBAC you will notice that we have a 1:1 recycling program and have a recycle bin for every trash bin at our facility. We strive to educate our customers about energy saving tips that they can do around MBAC as well as in their own homes. Please join us for another successful beach cleanup where we can all pitch in to keep our waterfront playground clean for all beachgoers.